We have 3 entities: Nixon, his nose, and the characteristic or quality that is Richard Nixon’s nose size. We follow BFO here in individuating qualities: thus even if I had a nose of the “same” size as Richard Nixon, we would not share the same nose-size quality instance, we would each have our own unique nose-size quality instance (for a nice treatment, see Neuhaus et al [PDF]). Now let’s look at a phenotypic label such as “big nose”. Intuitively we can see that this applies to Richard Nixon. But where exactly in this instance graph is the big nose phenotype? Is it the nose, the size, or Richard himself? Our decision affects the classification we get from reasoning. A big nose is part of a funny face, but in contrast a person with a big nose is a subclass of a person with a funny face. If you then put your reasoner results into a phenotype analysis you might get different results. To an ordinary common sense person whose brain hasn’t been infected by ontologies, the difference between a “a nose that is increased in size” and an “increased size of nose” or a “person with a nose that’s increased in size” is just linguistic fluff, but the distinctions are important from an ontology modeling perspective. Nevertheless, we may want to formalize the fact that we don’t care about these distinctions – we might want our “big nose” phenotype class to be any of the above. One way would be to make fugly union classes, but this is tedious. We can see exhibits is very promiscuous – when it connects to other relations, it makes a new exhibits relation. So we can see we are collapsing the distinction between “increased size of nose” and “nose that is increased in size” by instead defining a class “exhibiting an increased size of nose”. 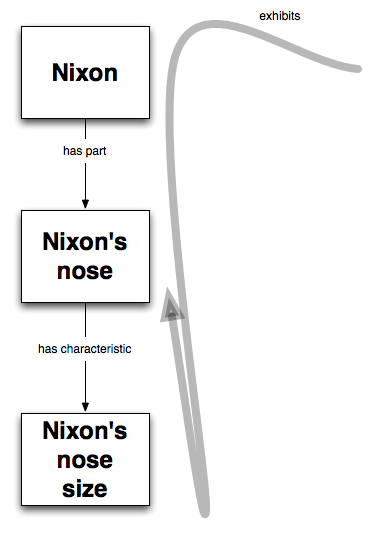 If we then try the DL-query tab in Protege, we can see that the individual “nixon” satisfies all of these expressions. Why is this important? It means we can join and analyze datasets without performing awkward translations. Group 1 can take a quality-centric approach, Group 2 can take an entity-centric approach, the descriptions or data from either of these groups will classify under the common “exhibits phenotype” class. Unfortunately, inverses put us outside EL++, so we can’t use the awesome Elk for classification. Not-caring in ontologies is hard work! 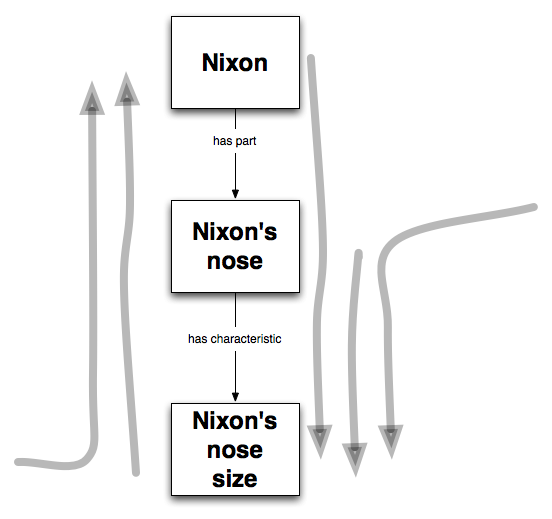 What if we want to care even less, and formally have a “big nose phenotype” class classify either nixon, his nose, or the bigness that inheres in his nose? That’s the subject of the next post, together with some answers to the bigger question of “what is a phenotype”. It may be slow to open this via the web. If you have the phenotype-ontologies repository checked out, you can open the file from the filesystem – external ontologies will be obtained via svn:externals. I recommend using Elk as the reasoner, others will be too slow with the combination of HP, MP, FMA, MA, PATO, etc. Unfortunately Elk doesn’t yet allow DL queries or explanations of inferences. The above ontology uses a slightly modified version of the definitions described in the Genome Biology paper – instead of modeling each phenotype as a single quality (e.g. redness of nose), we now model them as aggregates of phenotypes. This tends to work better for HPO, which has many composite phenotypes. Note also that we’re using a hacked version of the uberon bridging axioms to ZFA, MA and FMA – we treat these as precise equivalents rather than taxonomic equivalents. This is necessary as we mix uberon in with the species ontologies in the logical definitions.